The Nemesis theory may be about to get a new lease of life. The theory about a distant sub-stellar companion orbiting the Sun, and periodically glancing the Oort cloud of comets with disasterous consequences, has been around since 1984, when geophysicists noticed a marked periodicity in extinction level events on the Earth (1). Astrophysicists tried to explain what could have caused this periodic extinction cycle, with, among other ideas, a distant companion to the Sun (2,3), which became known as Nemesis (4). Such a theory is not without its critics, of course. Many doubted that the alleged periodicity of extinctions is actually accurate (and there have been a number of variations down the years, to confuse matters). Others argue that such a loosely-bound sub-stellar object in a highly elliptical orbit - which might extend out beyond a light year - is likely to itself be perturbed by external influences; and its own periodicity would therefore vary. Most simply point to a lack of discovery of such an object by finely-tuned infra-red sky surveys (5). Despite the scepticism, the theory has captured the imagination of many, and continues to generate thought-provoking articles (6). There are a number of variations on a theme, including, to some extent, my own Dark Star Theory (7), which explores the potential catastrophism associated with a rogue companion object, albeit located much closer to home than the original Nemesis concept. The extinction cycle aspect of the case also continues to intrigue. 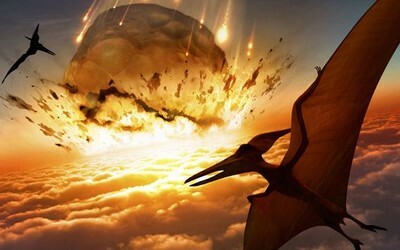 In 2010, a new study into a possible cycle not only confirmed a periodicity (of 27 million years, which takes into account a slight stretching out of geological time within more modern academic calculations), but found that it extended over a much longer geological time period than previously thought, of up to 500 million years (8). However, the authors were sceptical that a purported Nemesis object would be to blame, perhaps noting Nemesis-theorist Richard Miller's 2002 paper arguing that the orbit of the object had been perturbed some 400 million years ago (9), thus affecting its regularity over the full 0.5 billion year period in question. Still, something is causing this remarkably clockwork extinction cycle, and it's likely to be something astrophysical. A paper published this year has concluded that there is a very strong link between comet and/or asteroid impacts, and the major extinction level events which have taken place over the last 260 million years (10). This is despite the protecting influence of Jupiter and Saturn which should prevent most long-period comets from finding their way into the inner solar system (11). One of the authors, Michael Rampino, has recently argued that the periodic extinction events are linked to the carousel motion of the solar system through the galactic plane, which may in turn feature a disk of Dark Matter. This DM disk, or series of clumps, could affect comets and planets alike, above and beyond Galactic tidal effects (12). Such an assertion seems even more far-fetched than Nemesis. Both involve an unseen and undiscovered hypothetical ingredient, either in the form of clumps of dark matter, or missing sub-stellar objects in our backyard. But then, if these extinction events really are related to each other in a periodic way, there must be something pulling the trigger on a regular basis. This new study at least confirms that impacting comets and/or asteroids are to blame for the extinctions, and long-period comets, at least, must be breaking through the defences offered by Jupiter and Saturn. On a statistical basis, then, this implies that the impacting comet showers must be very considerable indeed. After all, for some of the shot to hit its diminutive target (i.e. the Earth and Moon), a cosmic blunderbuss is required. Nemesis, or a smaller cousin, may not be so fantastical after all. I heard this particular piece of science news on BBC Radio 4 last week, during an interview with one of the paper's authors, Mark Harrison, a Professor of Geochemistry at UCLA (1,2). His team, combined with scientists at Stanford, believe that they have discovered evidence of life on Earth as long ago as 4.1 billion years, predating the catastrophism of the Late, Heavy Bombardment (3). "Because zircon crystals are nearly indestructible, they operate as mini time capsules for geoscientists -- their trappings offer an unblemished record of the past. Recently, researchers at UCLA and Stanford analyzed 10,000 of the oldest zircon crystals ever discovered, sourced from ancient magma deposits in Western Australia. Inside a single 4.1-billion-year-old zircon fleck, scientists found pure carbon in the form of graphite. In conjunction with other geophysical findings in recent years (5), the authors are becoming increasingly confident in asserting that the early Earth appeared a lot more like it does now - rather than the hot, dry primordial lump of rock previously thought. An abundant presence of water on Earth so long ago (6) indicates that water was not delivered later by comets, as per the late veneer theory, but rather existed on earth right from the beginning (7). Earth (Tiamat) would have been a watery world, then - but not a 'water world' with no surface (as per Kevin Costner's flawed 1995 blockbuster), otherwise there would have been little chance of photosynthesis processes taking place in plant-life to provide the carbon the paper's authors have found in the ancient zircon crystals. I think this enhances the likelihood that the Earth began its existence further away from the Sun than it is now, and migrated inwards; because if it started here, then the volatile water should have been blasted away by the early Sun's activity, like on the other planets in the inner solar system. But the photosynthesis angle also argues against a pure 'water world' as Sitchin described for Tiamat (8). More likely the Earth of 4.1 billion years ago exhibited many of the complex surface features of modern day Earth, which was then refashioned by the late heavy bombardment 3.9 Gyr ago (due to the arrival of the rogue 'planet' Marduk? ), rebooting life. The coma of comet 67P consists of almost 4% molecular oxygen (2) which, according to theory, simply should not be. Planetary scientists are scrambling to explain this quirky, challenging finding. 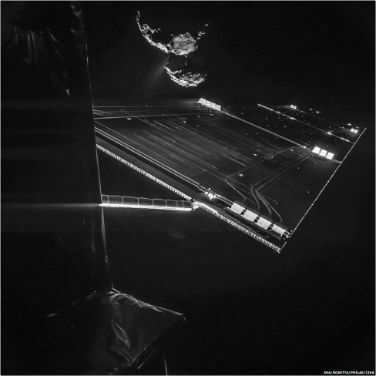 It should have been around since the beginning of the solar system, they say, surviving against the odds on the comet possibly trapped within grains of ice crystals and rock. Seems dubious, to be honest, but what else can they argue? Teams of scientists are trying to tweak their calculations of the Sun's proto-nebula to allow this oxygen to emerge unscathed. But this all seems a little desperate, a point which they seem willing to concede. The elephant in the room, naturally, is that the best known local source for oxygen is the Earth (although perhaps an ancient Mars might also have had an oxygenated atmosphere?). But that's way out of left-field for these guys... That implies that the source of this comet's existence lies in a cataclysmic impact between Earth and another cosmic body. Now, we know that such an impact did take place in the past, because current theories of Moon-formation require the apocalyptic intervention of a Mars-sized impactor, which appears to have occurred about 4.5 billion years ago (3). But this is surely too early in the history of the Earth for it to have had an oxygenated atmosphere (which, presumably, requires photosynthesis and, thus, life). Well, as we just discovered in the above article about zircon crystals (4), photosynthesis, water, life and thus oxygen in the atmosphere, were in place on Earth 4.1 billion years ago - after the formation of the Moon, but before the Late, Heavy Bombardment. Did one of these impact events 3.9 billion years ago chip off Comet 67P? In fact, the comet's value is three times that of Earth's, implying that the Jupiter-family of comets, to which 67P belongs, is not likely to be a major source of the Earth's water. That's according to the increasingly embattled late veneer theory, anyway. I suspect that this whole argument is volte face. If the comet was once actually part of the early Earth, then the argument that the comets brought water to the Earth may simply be back-to-front. Instead, the short-period comets may actually have obtained their water from the Earth instead. The pre-cataclysmic Earth would have had to have been highly aqueous, of course. And Earth's oceans may have since become 'polluted' by waters from long-period comets with different D/H values. So, the D/H value of Comet 67P may simply reflect the true value of the Earth's waters way back when; 3.9 billion years ago. A New Zecharia Sitchin book! "What if the tales from the Old Testament and other ancient writings, such as those from Sumer, Babylon, Egypt, and Greece, were not myths or allegory but accounts of actual historical events? Known for his ability to read and interpret ancient Sumerian and Akkadian clay tablets, Zecharia Sitchin (1920-2010) took the words of our most ancient ancestors as fact and, through decades of meticulous research, showed that they revealed a coherent narrative about the true origins of humanity and civilization. Drawing both widespread interest and criticism, his Earth Chronicles series of books, beginning with The 12th Planet, detailed how humanity arose after the arrival of the Anunnaki (“those who from Heaven to Earth came”), alien “gods” who created modern man in their own image and imparted gifts of civilizing knowledge. "Providing an insider’s look into the decades of research behind Zecharia Sitchin’s complete works as well as an in-depth overview of his theories, this collection includes carefully selected chapters from the Earth Chronicles series as well as never-before-published letters, articles, and lectures. We learn about the genesis of The 12th Planet in “The Book as a Story,” the Sumerians and their Anunnaki influences in “The Sudden Civilization,” the orbit of Nibiru in “UFOs, Pyramids, and the 12th Planet,” the prehistory of the Americas in “Cities Lost and Found,” the extraterrestrial origins of modern man in “The Cosmic Connection--DNA,” and much more. We get to read never-before-published lectures, culled from Sitchin’s decades of presentations, as well as the article that spurred the writing of There Were Giants Upon the Earth. I haven't yet read the book, so can offer no guidance as to how much of the book will be new to regular Sitchin readers. But it's certainly good to see a new, posthumous release of his writings lovingly curated by his niece. The ancient Mesopotamian Epic of Gilgamesh is one of the world's oldest written tales, telling the story of the eponymous King of Uruk's doomed quest for immortality. The cultured, urbane king takes on a travelling companion by the name of Enkidu, formerly a 'wild-man' who is tamed and cultivated by Gilgamesh. During their adventures together, they encounter the monstrous Humbaba in the Cedar Forests (likely in current-day Lebanon) who acts as an ogre-like guardian on behalf of the god Enlil. 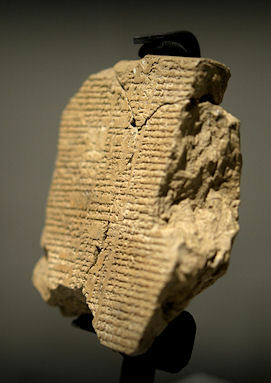 Excitingly for Gilgamesh fans, a previously missing passage from the epic has been found, imprinted upon a Babylonian tablet, written in cuneiform script, and authenticated by experts studying it at the Sulaymaniyah Museum in Iraq (1). It has now been translated by Assyriologists from the original cuneiform (2). Gilgamesh and Enkidu saw ‘monkeys’ as part of the exotic and noisy fauna of the Cedar Forest; this was not mentioned in other versions of the Epic. Humbaba emerges, not as a barbarian ogre, and but as a foreign ruler entertained with exotic music at court in the manner of Babylonian kings. The chatter of monkeys, chorus of cicada, and squawking of many kinds of birds formed a symphony (or cacophony) that daily entertained the forest’s guardian, Humbaba. The aftermath of Gilgamesh and Enkidu’s slaying of Humbaba is now better preserved. How can we interpret this in a Sitchinite context? Might Enkidu represent the early Earth hominids which were genetically manipulated by the Anunnaki colonists, and enslaved? Some of the threads in Sitchin's writings reflect these change in Enkidu's nature. Indeed, he notes that the name 'Enkidu' means "by Enki created" (6), not unlike humanity presumably. To Sitchin, the location of the guarded Cedar Forest in Lebanon was of central importance, as this was the landing place of the gods. But might the whole narrative about Enkidu also be metaphorical for the transition from hominid to human? It seems to be in keeping with other Mesopotamian myths about the origins of humanity which, if read literally, imply outside intervention. In which case, I find it interesting that these new segments of the epic, which have emerged very recently, include a backdrop of musically-talented monkeys in the forest - one of which Gilgamesh and Enkidu 'meet' (3) - and a closer intertwining of Enkidu and Humbaba. Taken together, an entire faction of uncivilised, lower hominids emerges from the tale which Gilgamesh must refine and/or overcome to achieve his vainglorious goal of immortality. By the way, did you know that the controversial scholar Robert Temple, author of 'The Sirius Mystery', has also produced a translation of the Epic of Gilgamesh which was performed in the Royal National Theatre in London in 1993 (7)? Two recent scientific findings, published in academic journals, have raised the prospect of finding habitable tidally-locked planets orbiting close to cool dwarf stars. This is a significant boost to the Dark Star Theory, because it seems highly likely that for a planet in a sub-brown dwarf system to be habitable, it would have to be so close to the parent 'star' that it would be tidally locked (1). By this, we mean that the orbiting planet is forced to attain a rotational period that is synchronous with its orbital period. If you want to see that in action, simply look up into our sky most nights. The Moon is tidally locked, due to its close proximity to Earth, which is why we only ever see one side of the Moon facing us. "But in new research by University of Washington scientists published in the journal Astrobiology, a planet in a compact orbit around a red dwarf star could receive a gravitational boost that could act as a planetary immune system of sorts, potentially shielding the worst radiation from sterilizing nearby worlds. This mechanism would put red dwarfs back in the life-hunting arena. It was generally thought that tidally-locked planets were devoid of planetary magnetic fields, like the magnetosphere that surround Earth. But this may not be the case. This is, of course, the picture I have painted for a possible binary Dark Star in our outer solar system (4) where an Earth-like world might be warmed by its proximity to a rather old sub-brown dwarf. Later, in one of my novels, I described how such a viable home-world might appear (5). I assumed, at that time, that there would be a warm, viable light side, but also an extremely cold, inhospitable dark side to this home-world, providing us with an overall appearance for this world which I likened to the 'eye of Horus'. 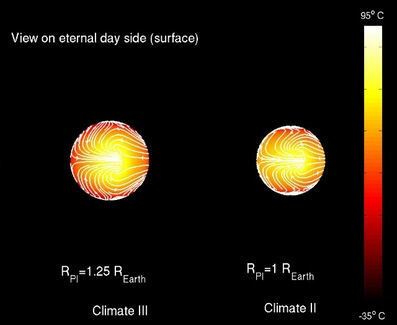 However, new research, published last month, suggests that certain jet-stream weather patterns on roughly Earth-sized, tidally-locked worlds in compact orbits around dwarf stars might provide a more moderate climate than first thought (6). 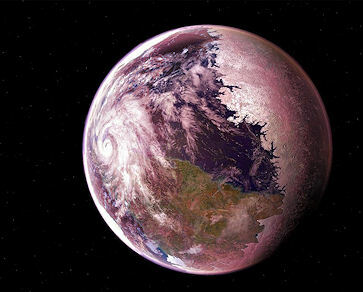 "For tidally locked exoplanets to be potentially habitable, they must have a functional planetary "air conditioning system" that balances surface temperatures across the light and dark sides. In one climate type uncovered by the [computer] simulations, this air conditioning system is overridden by an eastward wind jet (fast flowing air currents) that messes with circulation in the upper layers of the atmosphere along the equator and prevents heat transfer to the night side. This analysis also provides us with a maximum rotational period for such a viable home-world - of just 12 days! If this was a planet orbiting around the Sun, then this proximity would mean that the world would be utterly frazzled. But orbiting around a sub-brown dwarf, such a short rotational period is highly reasonable. The Galilean moon Europa, which orbits Jupiter in about 3.5 Earth days, has a global sub-surface ocean, warmed by tidal heating. So, an Earth-like world at a similar distance around a sub-brown dwarf in the outer solar system would be even warmer, potentially have its own protective magnetic field, and possibly a viable atmosphere whose 'air-conditioning system' might make surface conditions moderate on a global scale. It appears that the Neanderthals managed to keep Homo Sapiens out of Europe for 40,000 years before we eventually broke through, fatally eroding their species. How do we know this? A new discovery of 47 human teeth at the Fuyan cave in Daoxian, southern China, dating back between 80,000 and 120,000 years, show that a massive 'out-of Africa' migration was successful in an easterly direction across Asia (1,2). Yet, a northward progression through the Levant into Europe was blocked until ~40,000 years ago. "University College London paleoanthropologist María Martinón-Torres said our species made it to southern China tens of thousands of years before colonizing Europe perhaps because of the entrenched presence of our hardy cousins, the Neanderthals, in Europe and the harsh, cold European climate. "This finding suggests that Homo sapiens is present in Asia much earlier than the classic, recent 'Out of Africa' hypothesis was suggesting: 50,000 years ago," Martinón-Torres said. "[Paleoanthropologist Wu] Liu [of the Chinese Academy of Sciences' Institute of Vertebrate Paleontology and Paleoanthropology] said the teeth are about twice as old as the earliest evidence for modern humans in Europe. "We hope our Daoxian human fossil discovery will make people understand that East Asia is one of the key areas for the study of the origin and evolution of modern humans," Liu said. How this fits into Zecharia Sitchin's theory is open for debate. He did write about the sudden blossoming of civilisation in China which occurred around 4000 years ago, and some of the similarities between ancient Chinese script and cuneiform, as well as comparative Asiatic mythologies (4), but not the prehistoric migrations of early humans. There are also Chinese pyramids which appear to date back 5000 years, perhaps older (5). Were the Anunnaki making their presence felt in prehistoric China, I wonder, seeking natural resources? The presence of gold throughout China is amply exploited by modern mining companies, and China is now the world's largest gold producer - although gold reserves in the country amount to only about 7% of the global total (6). Either way, such an extensive migration across the Asian landmass begs the question as to why early humans failed to make similar progress into Europe. Although the bitterly cold glacial winters of the Ice Age era doubtlessly played a part, it is considered likely that the Neanderthals effectively shut out any attempted migrations of Homo Sapiens (2). 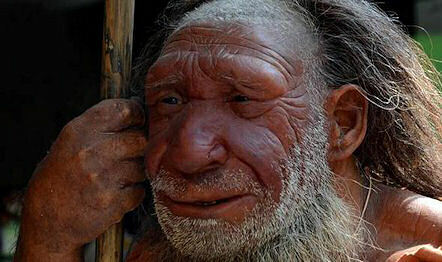 I have a soft spot for the Neanderthals, mainly because some folk close to me used to compare my appearance to them, back in the days when I had hair! They were bigger, stronger and likely just as intelligent as us (for what that's worth). A real mystery about why they lost out to us, while the last glacial period was still in full swing. We humans have about 2% of the Neanderthal genes in us still, (with at least 20%, and perhaps as much as 70% of the Neanderthal genome spread out through the human population (7)). These Neanderthal genes are mostly to do with skin and hair, likely aiding human resilience to cold climates. So, interbreeding clearly played a part in the story of the human replacement of Neanderthals on the European continent, with us perhaps 'stealing' the adaptive genes necessary to deal with the cold European Ice Age climate. The complex picture of species divergence and then interbreeding begins to spiral further when you also include the Denisovans (8). Alternatively, perhaps all of this simply reflects the status of these archaic human species as our genetic cousins through the lens of the genetic manipulations performed by the Anunnaki? Divergence between Neanderthals and the human lineage occurred over half a million years ago, perhaps reflecting a mixed bag of the results of their work to create useful hominids. In my phase of novel writing the Neanderthals make an appearance on the Anunnaki home-world, which I imagined they would be ideally suited to (9). I imagined that they were removed from here to serve the 'gods' at home, leaving behind us weaker brethren. But that remains just my idle speculation. As was discussed in the above article, it is generally accepted that an apocalyptic bombardment ripped the inner solar system apart about 3.9 billion years ago. This 'late, heavy bombardment' took place well after the solar system had stabilised into an orderly state, and occurred over perhaps hundreds of million years in duration (1). It's effects were sensational - the chunks of rock that hammered the inner solar system were of immense size. Even the smaller impactors could have led to the extinction of all life on Earth, let alone the big beasts that pummelled us, and the Moon. It is the Moon's surface itself that provides the most startling visual record of the bombardment, as well as the rock samples which have enabled planetary scientists to date the events to this period (2). By contrast, tectonic movements and geological activity during the intervening 4 billion years or so have disrupted the cratering which was also doubtlessly visited upon the Earth at the same time. ""GRAIL data confirm that lunar mascons were generated when large asteroids or comets impacted the ancient moon, when its interior was much hotter than it is now," said Jay Melosh, a GRAIL co-investigator at Purdue University in West Lafayette, Ind.. "We believe the data from GRAIL show how the moon's light crust and dense mantle combined with the shock of a large impact to create the distinctive pattern of density anomalies that we recognize as mascons." 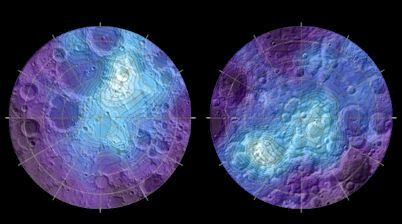 "Although the upper layers of the moon's crust are too fractured to retain much of a record of the collisions from the Late Heavy Bombardment, Soderblom and his colleagues suggest that the deeper layers might provide an idea of how many large impacts the moon and other bodies in the inner solar system suffered during this ancient onslaught. This research could even help scientists track the origins of the rocks that hurled around during the Late Heavy Bombardment. There are many hypotheses about what caused the bombardment. 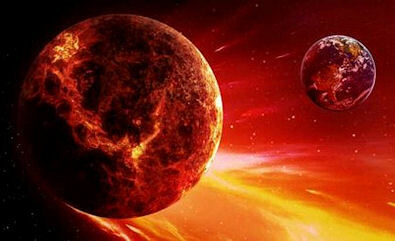 Migration of the gas giants is a current favourite, an hypothesis known as the Nice model (7). The idea goes that their collective migration caused Neptune to graze the Kuiper Belt, sending swarms of asteroids and comets into the inner solar system. I don't think this degree of complexity is required. I suspect that an outside entity was to blame, crashing through the stabilised solar system accompanied by world-shattering debris (8). My bet is that this object would have been a sub-brown dwarf companion of the Sun, perturbed from its wide, elliptical orbit into the path of the planets. Perhaps these on-going investigations into the hidden cratering of the Moon will reveal new insights into the source of the bombardment, and solve this mystery once and for all. 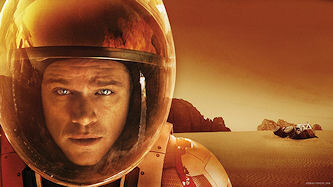 Plenty of great science in this film, which was very NASA focussed in both the storyline and sentiment. It got a bit crazy towards the end, as the risks taken to save the stranded astronaut got wilder. Also, some of the 'mutinous' actions of the crew, and the subterfuge used to give them an alternative mission, could have been straight out of my novel 'The Followers of Horus' (along with the rotating gym with exercise bikes!!). The oddest part of the movie for me were the two rockets sat upright on the Martian surface. The first, which was parked alongside the colony, was carefully monitored, and prepared for immediate readiness in case a dust storm flared up. In the event that one did, the tilt of the rocket became literally the tipping point towards potential disaster. The precarious nature of the operation was well understood by the astronauts, to the extent that they had to make a tough choice, or all end up stranded. Compare and contrast to the second rocket, left some way off for what I guess was intended to be a future mission. Firstly, how had that rocket actually got there, without a crew, standing perfectly upright like Thunderbird 1? Secondly, if the global dust storms were such a known risk, then how come this rocket was knowingly left like that, exposed to the risk of getting knocked over - presumably for years? Uh huh. But, still an awesome movie, I have to say.